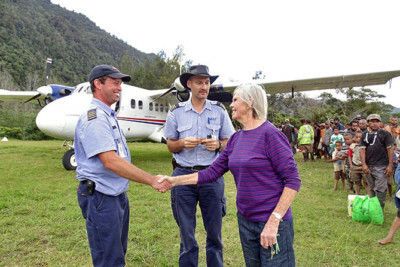 The Twin Otter is well known as a dependable aircraft in rough flying conditions, making it ideal for MAF’s operations in Papua New Guinea (PNG). Rough and rugged terrain, deep valleys, rainforests and high mountain ranges make travel by road in PNG virtually impossible. With no real alternative means of travel, people are reliant on flying to enable them to reach other places, along with their goods and supplies. Carrying up to 1,800kg of freight or 20 passengers, the Twin Otter can fly in and out of airstrips less than 400 metres long and with slopes of over 12%. 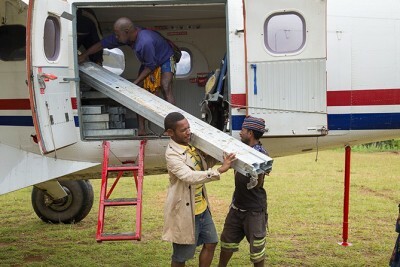 It is a true bush aircraft, in a class of its own and providing access to communities that are otherwise unreachable. The large capacity and large cargo doors make the Twin Otter great for a high volume of supplies and passengers. Even bulky items such as building materials, engines and livestock can be transported. Sacks of coffee, a valuable source of income for many communities, are transported to market to be sold, generating an income for many families. Powered by two turbine (PT6A-34) engines which use readily available Jet-A1 fuel, the high wing Twin Otter is equipped with dual Garmin IFR GPS navigation systems for safe and reliable flying. Noted for its rugged construction, the Twin Otter is highly manoeuvrable and versatile and can be flown slowly and in tight circles. The enhanced reliability and performance of twin engines makes it ideal for the terrain in which it operates. Excellent STOL (short take-off and landing) capability enables it to land comfortably on short bush airstrips scraped out of the sides of mountains or hidden away in deep valleys. Not only the largest aircraft in MAF’s fleet, the Twin Offer is also highly manoeuvrable, versatile and ideally suited to the unique terrain in PNG. The 65ft wingspan is the same as the length of 4 and a half Ford Focuses!